Royal College of Nursing - Madukkarai, Coimbatore, Tamilnadu, India. Marappalam, Madukkarai(PO), Coimbatore - 641 105, Tamilnadu. of the vital importance of Nursing. Our College is aimed to produce the very best professionals in this field to help the society. Our Royal College of Nursing is a part of Royal Educational Institutions established by Royal Education Trust in the year 2000. The college strives to bring out good nurses to the society. It works in accordance with norms and standards, prescribed by the Indian Nursing Council, New Delhi and Tamilnadu Nursing Council, Chennai. 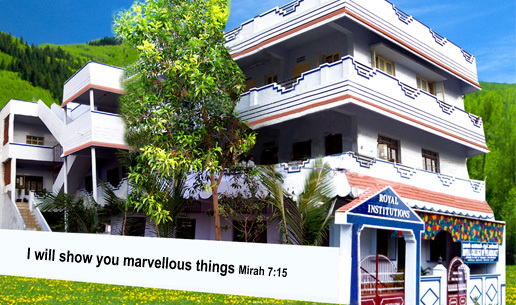 The college is situated in a salubrious and serene campus at Marappalam, Madukkarai(PO), Coimbatore - 641 105. It is easily accessible from the coimbatore city and very near to Kerala border. There is regular bus services for every 10 minutes from Coimbatore and Walayar. Our Motto is " EDUCATE - EXPLORE - ELEVATE "
© 2009 Royal Educational Institutions, Madukkarai, Coimbatore, Tamil Nadu, India.| Web Solution by Skynet Technologies .